4/22/18: Is There a Better Place for Affordable Housing? At last week’s City Council meeting, I experienced a disappointing setback. And so, I believe, did Encinitas. The housing plan we’ve been working on for the last year contained only one site with 100% affordable housing – called L7, on Quail Gardens Drive. At the end of a long meeting, Deputy Mayor Joe Mosca reversed his previous support and made a motion to remove this site from our future housing plan. Over the strong objections of Councilmember Tasha Boerner Horvath and me, the motion passed 3-2, with Councilmembers Tony Kranz and Mark Muir supporting the motion. In the last six years, the city has only seen 66 affordable units built, instead of the 1,286 units we are required to produce under state law. That’s 5% of the target. This L7 site would have produced more affordable housing at 190 units than every other site on our housing plan combined. The explanation for removal was that there are better places for affordable housing, the neighbors are strongly opposed, and Quail Gardens Drive is already over-burdened. They say we should sell this 6.7 acre site for development of larger, higher-income homes, pocket the money for affordable housing, and find a better place that is closer to transit and commerce. In a perfect world, that sounds like a great plan. But in this real, messy, conflict-based, housing-opposed world, we just swapped a real housing solution for something speculative, uncertain and years away. The positive side of this is that the intense support and opposition over L7 started a public conversation about affordable housing in Encinitas that has strong momentum. Local residents are giving a face to the middle class, working people who live in affordable housing, and just how imperative the need is for more. Difficult changes often take multiple efforts to succeed. For example, the city tried several accessory dwelling unit (granny flat) policies of marginal effectiveness before passing a more comprehensive and substantial one earlier this year that waived all fees and loosened regulations. It is already showing good early success. My colleagues repeatedly say that they do want to build affordable housing. That means we have to do things differently in Encinitas. I look forward to working with them to bring an affordable project to fruition. This Coast News story does a good job of capturing the intensity of the feeling at the council meeting. The Lion’s Club is having a fun annual fundraiser Wednesday, May 2nd at 6 p.m. My husband and I are making it a date night! Join us to support a great cause! 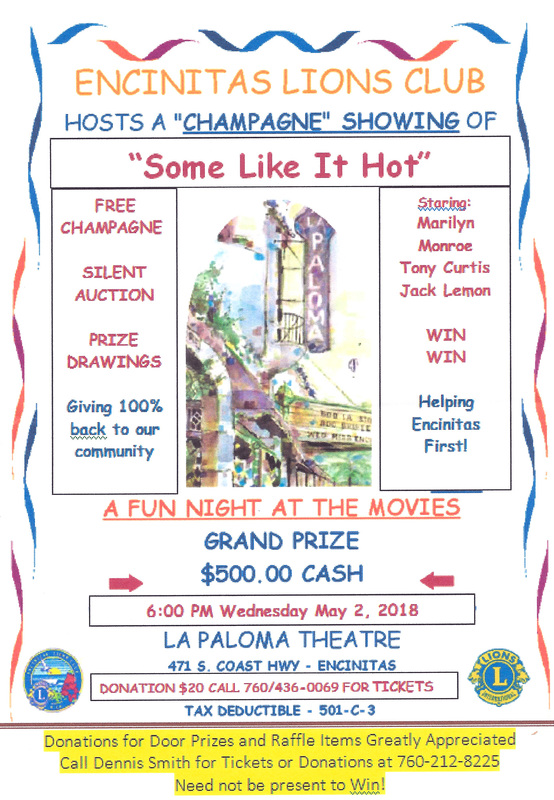 Champagne Night at the Movies at La Paloma Theatre, 471 S. Coast Highway, Encinitas. What: “Some Like It Hot”, starring Marilyn Monroe, Tony Curtis, and Jack Lemon. Filmed at the Hotel Del Coronado! Details: Free champagne, prize drawings, a silent auction, a 50/50 drawing and a grand prize of $500 cash. All the donations will go back to our community. Encinitas Lions are a 501c3. Thank you to the Community Resource Center for their critically important work helping those who are struggling in our community. Their 23rd annual English Tea was as heartfelt, touching and inspiring as ever. I spoke a few words at the beginning of the program, highlighting the profoundly simple statement that, “Those who have homes are not homeless.” We need to do more to help people keep the homes they have and help those without a home to find one. 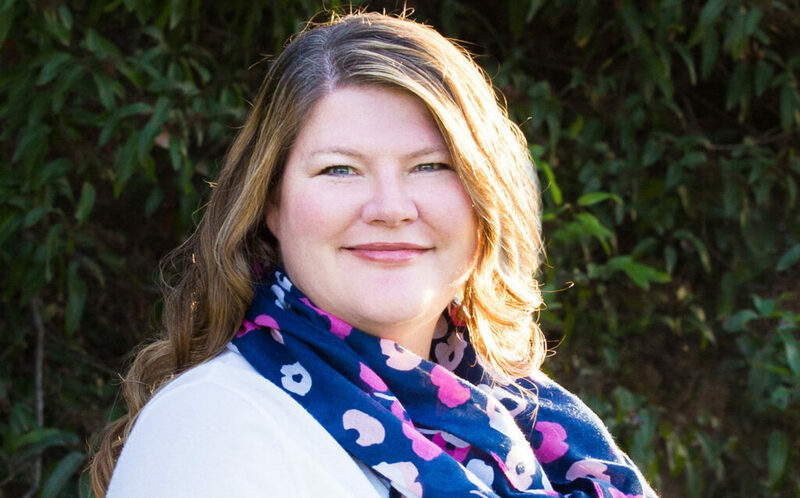 Please join me in supporting my City Council colleague Tasha Boerner Horvath in her race to represent Encinitas, Carlsbad, Oceanside, Vista and Camp Pendleton in the 76th Assembly district. 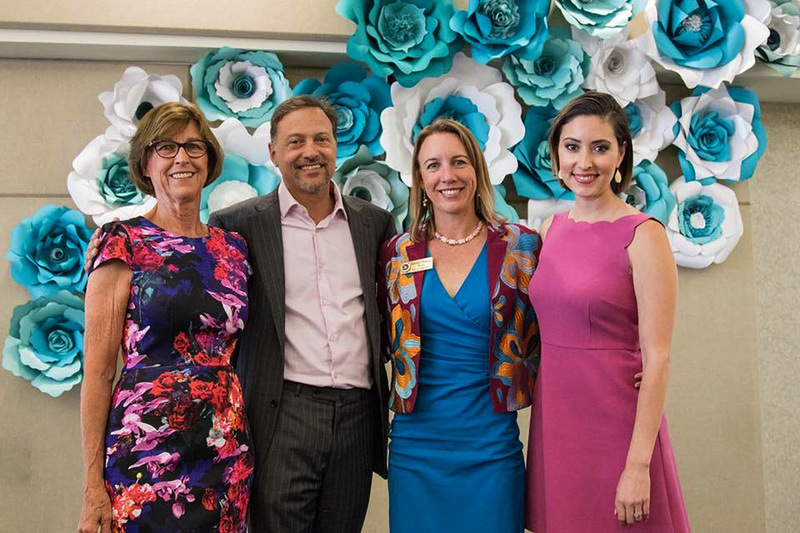 She’s courageous, principled, hard working and committed, and her election will make a positive difference to the people of Encinitas and throughout the state. The primary election is six weeks away! I have every confidence in her ability to sweep her seven opponents, and to represent us well after she wins. She needs our support to get there. Her website is here and you can donate by clicking here. It’s my honor to invite you to the Mayor’s 25th Annual Interfaith Community Prayer Breakfast on Thursday, May 3, from 7:15 to 9:00 a.m. at the Encinitas Community and Senior Center. Tickets are $20. 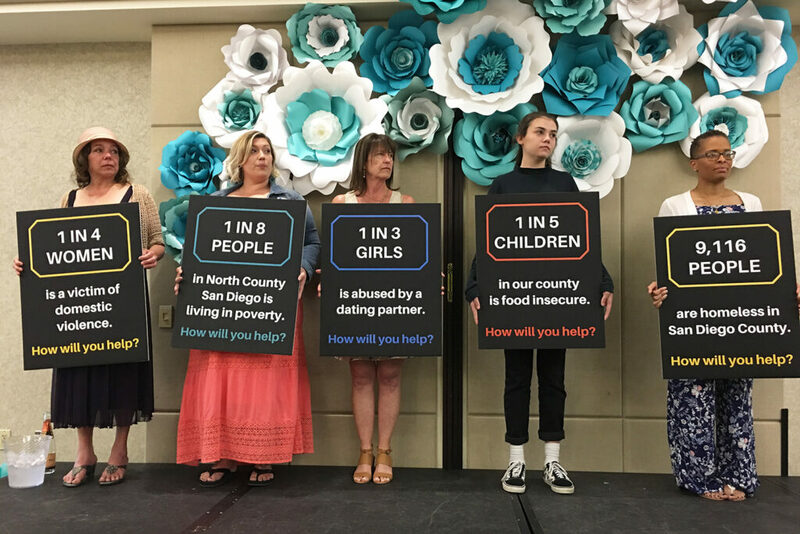 The event features a full catered breakfast, live music and a lineup of dynamic speakers from the Interfaith community including Reverend Meghan Conrad Cefalu, the minister at the Unitarian Universalist Fellowship of San Dieguito, as the keynote speaker. We’d love to have you with us at this inspirational gathering! You can RSVP to 760-633-2618 or purchase tickets online. Penning these newsletters is part of my strong personal commitment to transparency in local government, and my direct connection to you. Carving out the time to reflect on the issues in writing also helps me clarify and prioritize the massive amount of information that passes through my office every week. Many of you frequently write to me with thoughts, questions and insights, and I love receiving your feedback. Just a reminder, I send these emails most Sundays at 5 a.m. but for various reasons, such as an off week at City Council or a vacation, I don’t send one. Next week will be one of those times – I’m backpacking in the Grand Canyon to hike Havasupai Falls. I hope to share a photo or two with you when I return! Thank you for caring about Encinitas and being a part of our local government. 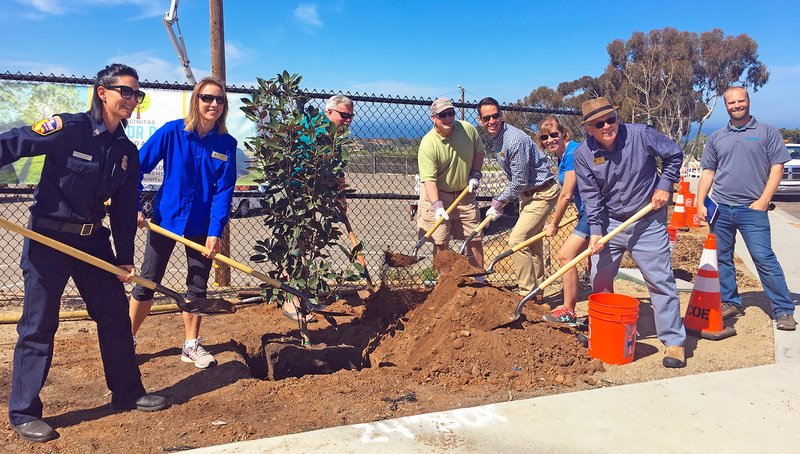 The city and its partners celebrated our seventh Arbor Day yesterday by planting more than 20 magnolia and other trees on Melba Road, which borders the north side of San Dieguito Academy. For years to come, these new trees will help provide shade for those walking to school. We love our trees in Encinitas! And happy Earth Day!